The Graduate Aptitude Test in Engineering (GATE) application procedure begun today, September 1, 2017. 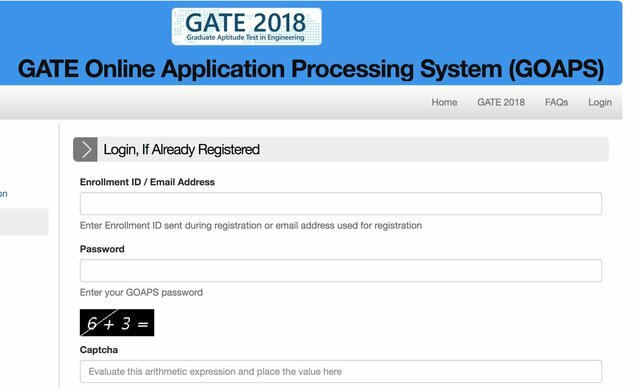 Interested and eligible candidates will be able to apply for the test through the GATE Online Application Processing System (GOAPS). Those candidates who have already registered themselves for GATE in previous years or this year, need to simply log in with their personal details. Those who haven’t registered yet, need to first register themselves in order to apply for the test. The online application process will close on October 5, 2017. Candidates need to visit the official website of GATE. Candidates who have already registered can log in with their personal details such as enrolment id and password. Unregistered candidates will need to register first in order to get their enrolment id. Candidates need to fill up the application form and upload their photograph and signature. After submission of form, candidates need to pay the application fee and take a print out of the completed form. Check here to see the sample of how to fill GATE application form. GATE will be held on February 3, 4, 10 and 11 for admission of candidates in 23 engineering postgraduate streams in engineering institutes across the country.